If the barrier faulted, what do you think would happen? 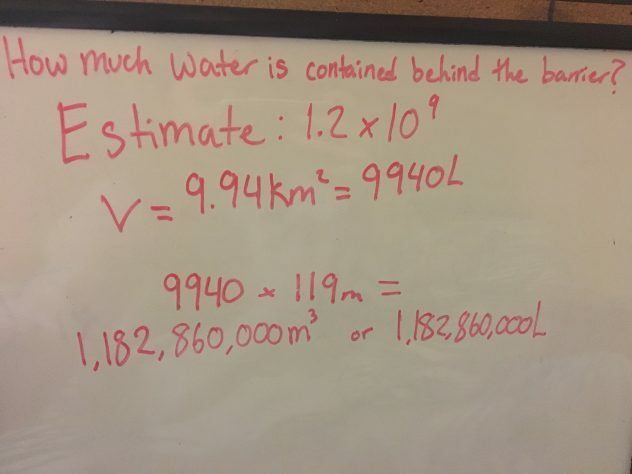 Consider; how much water would escape, and what kind of power is the escaping water equivalent to? The formula I used to find the volume of the amount of water in the lake was Surface Area (9940 L) times Average depth (119m). The volume equaled 1,182,860,000 L of water in the Garibaldi lake. If the barrier faulted I think most of the water would be released and cause flooding in the Squamish rivers and town. I don’t think all the water would be released because some water would stay at deepest part of the lake. The waves that would be created would be so big the impact could reach as far as Vancouver island. “The potential energy at 1,400 metres elevation, of 1 trillion litres of water, is 200 times the energy released by the bomb on Hiroshima”. Said Dr. Quane, a researcher of Garibaldi lake.